Allu, taas sulaa jää, Lenin elää ja alus saa tulla! In response to an Infrequently Asked Question (over there on the right under Links), and then in a September 27 post called “Take a number for service,” I have expressed my admiration for the Ota vuoronumero! system used by many retail establishments and offices to determine the order of service. Basically, it’s the drill that in the States we associate with the deli counter. Roman Schatz, the author of a book called From Finland with Love (Helsinki: Johnny Kniga, 2005), offers testimony in support of my friend’s contention. The prevailing ethos of Finnish motorists, he claims, is “Drive as fast and as recklessly as possible, ignore all rules unless the police are near, sabotage, hamper, and impede everyone else on the road” (p. 78). I’ll have to admit that I have occasionally seen this streak of misanthropy for myself at bus stops, where Finns eschew the queue in favor of the scrum. From Finland with Love is an insightful, albeit vulgar, little book written from the perspective of a German man who fell in love with a blonde he “met in a subway station in West Berlin” (p. 9). He followed her to Finland in 1986, and now he is “happily divorced” (p. 10) with two blonde children. Schatz’s book opens with a testimonial: “I love Finland, and I’m not ashamed to admit it” (p. 10). Of course, I say that Schatz’s book is insightful because he seems to be impressed with many of the same things that have impressed me about this country. For example, he marvels at the way Finnish pedestrians refrain from crossing against the light. They will “stop at red lights, even in minus thirty degrees at four o’clock in the morning with absolutely no cars in sight” (p. 75). He argues (persuasively, in my view) that the celebrated Finnish love affair with nature exceeds the bounds of reason: “For the Finns summer provides a great opportunity to leave behind the unnatural urban way of life that they never really felt comfortable with anyway: It’s back to their roots—meaning back to the state of bliss where you don’t have to see anybody for weeks and thus can afford to walk around in rubber boots and old sweatshirts, your face, hands and legs covered with mosquito bites” (pp. 85-86). 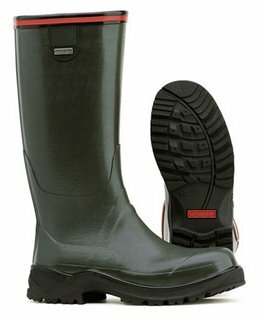 Nokia, incidentally, made rubber boots (see photo above) before they turned to cell phones. Based on a memorable experience with a drunk at the Merikoskenkatu bus stop (see the post called Hyvää Matkaa), Schatz’s account of the drinking habits of Finnish men rings all too true. “For a foreigner it’s difficult to share the Finnish enthusiasm for that one more drink at six o’clock in the morning” (p. 127). "When you first arrive, Finland looks like a normal, pretty, expensive little country. Well, the light and the colours are different, at least in summer. In winter there isn’t really any light” (p. 13). “So what exactly are the benefits of learning Finnish? Well, you can enjoy the most beautiful palindromes in the whole world: Allu, the ice is melting again, Lenin is alive and the vessel may come! Allu, taas sulaa jää, Lenin elää ja alus saa tulla!” (p. 23). Finnish women “run the show. Finland is a matriarchal society” (p. 28). “If you have decided to become a better person and rid yourself of everything unhealthy, unsafe and immoral, you’ve come to the right place. Finland cares for you like a loving mother” (p. 43). Ergo, “Finland has the highest taxation and the lowest purchasing power in Europe” (p. 80). “Where you’re from is of absolutely crucial importance in Finland…. The Finnish identity is based on places and ancestors rather than on work and career” (pp. 106-107). “Losing control under the influence of alcohol (except behind the wheel—KK) is perfectly acceptable in this country” (p. 126). On bridging the culture gap: “Give them (the Finns—KK) everything you’ve got. Get drunk with them, go to their saunas, jump in their lakes, eat their food, learn their language, sleep with them. See where it gets you” (p. 133). Click on the title of this post, if you dare, for a link to Roman Schatz’s personal website.